The popular Eagle’s View Trail is rightly considered one of the region’s “top trails”. 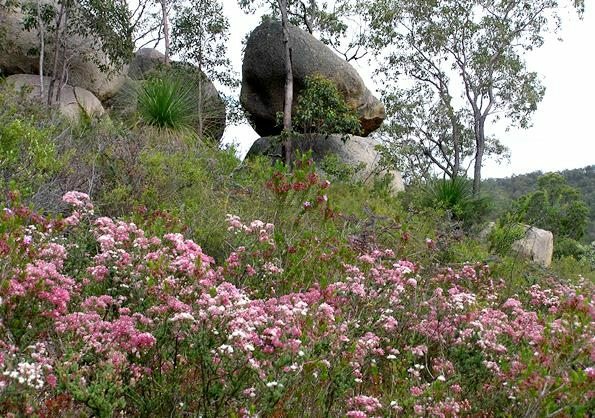 It remains the only established trail in the Darling Range near Perth that offers bushwalkers a day’s circuit walk of good length and quality scenery. 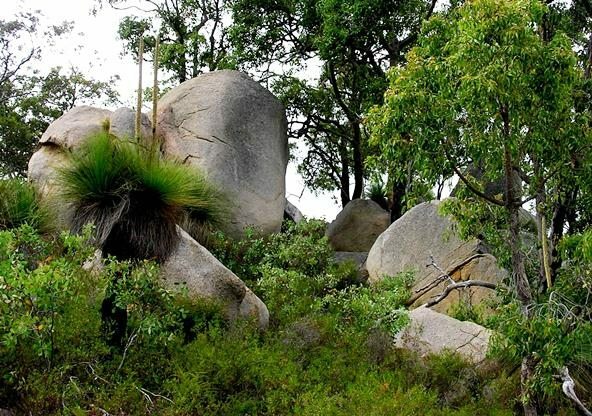 The walk covers varied terrain, partly along stream valleys and partly along the top of the Darling Scarp, past granite tors, and across laterite plateaus. There are impressive views across the Swan Coastal Plain to Perth and across the local valleys. 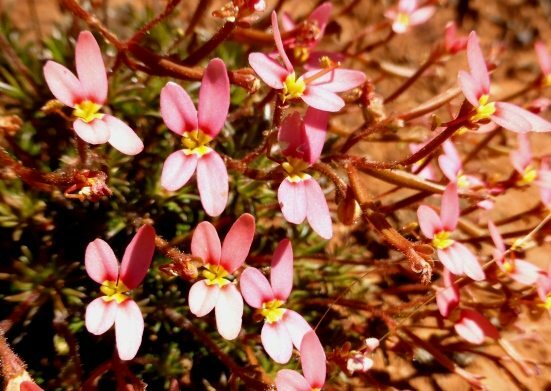 The track also passes through varied vegetation types, including heathlands, open wandoo woodlands and mixed jarrah-marri-wandoo forest. 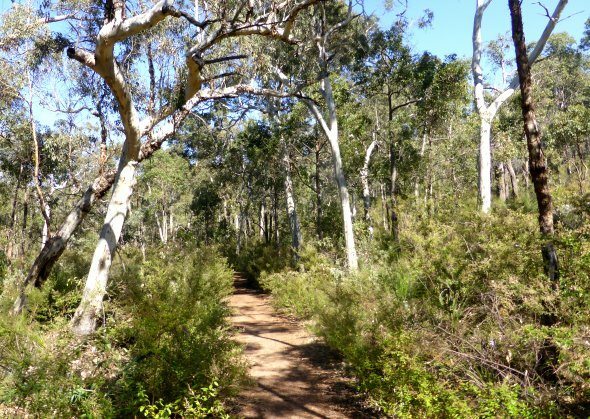 This popular established trail within John Forrest National Park was constructed by the Perth Bushwalkers Club during 1993-98. 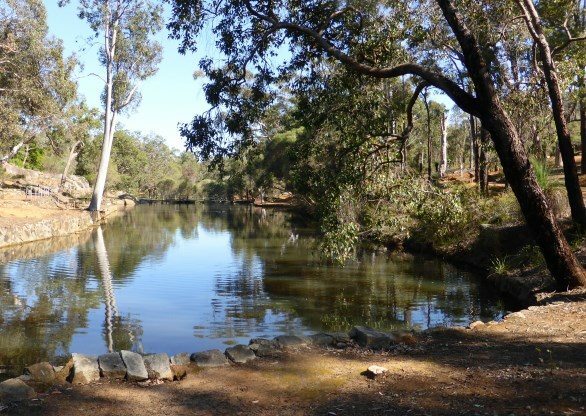 The Trail was selected by DSR and DEC in late 2008 to be promoted as Trails WA “Top Trails”. 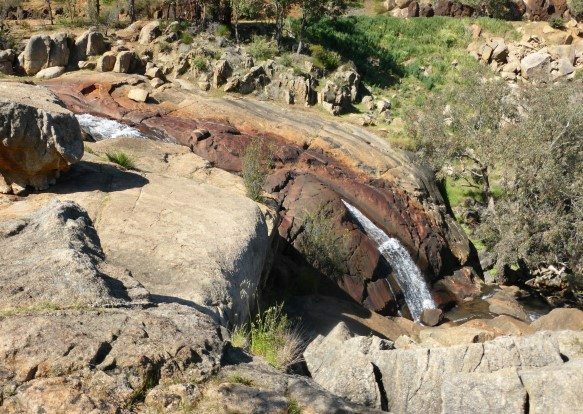 It gives access to the less known northern area of the Park as well as the familiar Jane Brook area, including the National Park Falls and Hovea Falls. The walk covers varied terrain (including moderately steep in places), partly along stream valleys and partly along the top of the Darling Scarp, past granite tors, and across laterite plateaus. 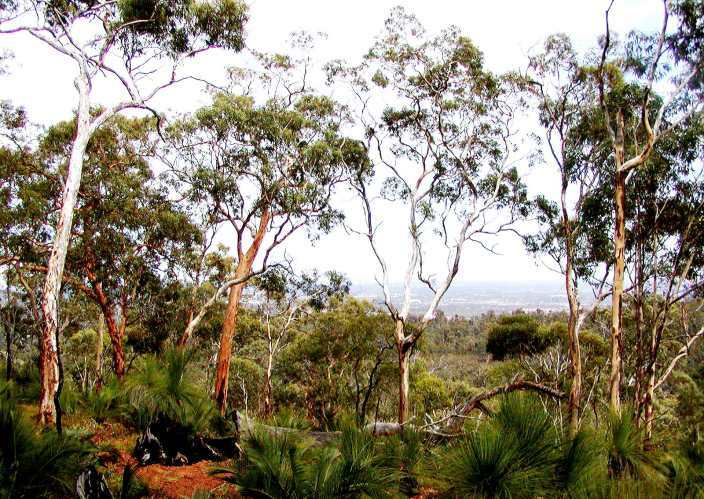 There are impressive views across the Swan Coastal Plain to distant Perth and across the stream valleys. 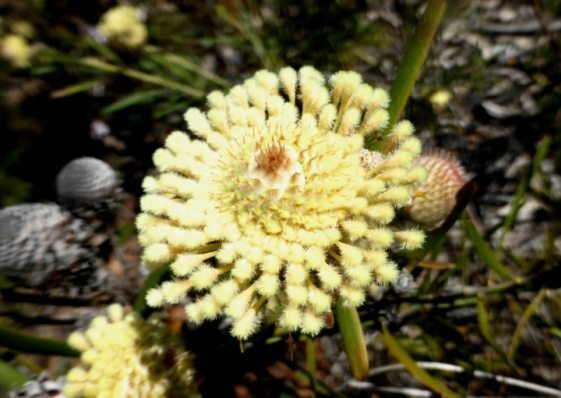 The track also passes through varied vegetation types, including heathlands, open wandoo woodlands and mixed jarrah-marri-wandoo forest. 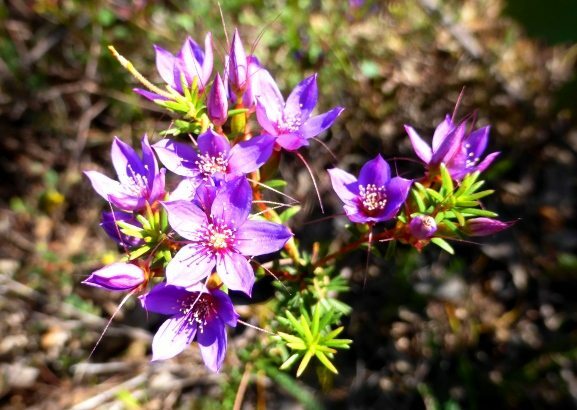 Some of the streamsides in the Park, especially along Jane Brook, are severely infested with Watsonia, an introduced pink- to red-flowering weed, which chokes out the native heathland. DBCA and volunteers are now using a selective herbicide 2-2DPA (‘Dalapon’) to destroy the weed with encouraging results so far, including re-emergence of native heathland plants. 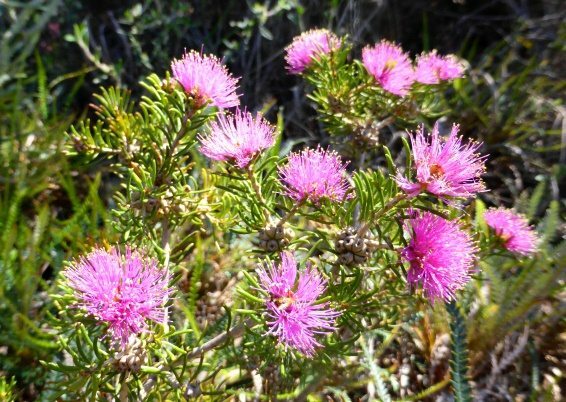 Efforts by community groups to locally control this highly invasive weed elsewhere along the Darling Scarp, and at Piesse Brook, also appear to have had some local success. 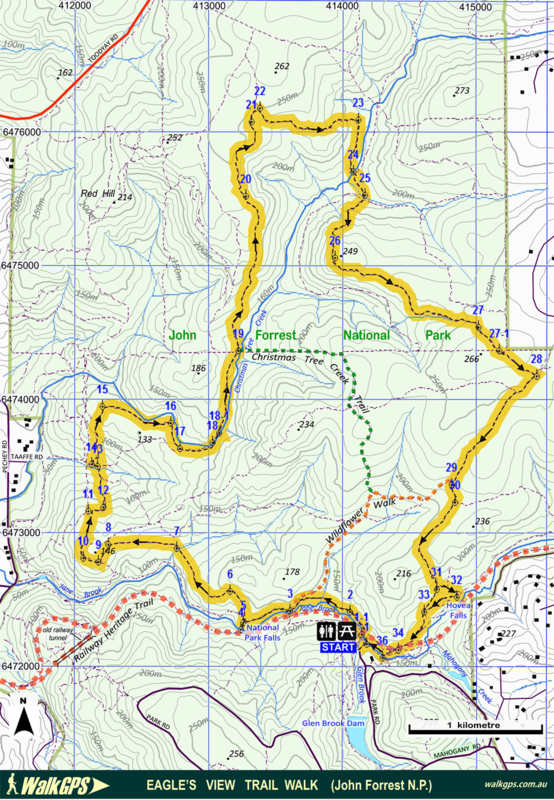 Sections of this trail (about 1/3 of the walk length) are also incorporated into the WalkGPS Northern John Forrest National Park Walk on this site. 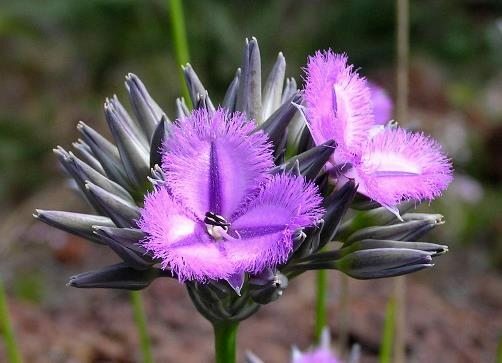 This additional walk provides for some off-track heathland and forest walking. Most key turning points on the trail are indicated by yellow eagle emblem markers and provided you have a map in hand, GPS navigation is certainly not required. From the Start point below the carpark (at waypoint ‘START’) cross the footbridge to ‘1’ on the north side of Jane Brook. Turn left to follow the Trail west (in downstream direction), initially passing under the old iron railway bridge at ‘1-1’. Follow the Trail down the valley. It shouldn’t be necessary to refer to the waypoints as the Trail is quite well marked with an Eagle symbol on a yellow background. Make a short diversion to National Park Falls (at ‘4’) but rejoin the track at ‘5’ and take the trail which is signed to the ‘Eagle’s View Lookout’ and heads initially northward and around the hillside. After crossing a gully at ‘7’ the track climb westward, with good views southward across Jane Brook to the Railway Heritage Trail. The track veers around the ridge top after ‘9’ and reaches large boulders at a lookout point at ’10’, at the top of the Darling Scarp. There are excellent views across the coastal plain to Perth. Follow the track northward and meet a brief section of vehicle track which crosses a stream course to a T-junction at ‘13’. Turn left to ’14’; then leave the vehicle track to follow the Trail as a foot-track which climbs quite steeply towards a ridge and then turns eastward at ’15’ to follow the valley of Christmas Tree Creek upstream (via ‘16’) away from the Scarp through heathlands and past granite tors. Meet a vehicle track at ’17’. Veer left to follow it initially eastward and then northward, crossing the Creek at ‘18’ and passing small rapids hidden just to the right (east) of the track (see ’18-1′). When the vehicle track meets a wide W-E vehicle track (at ’19’; along a former park boundary), the Trail continues north as a foot-track and begins rising away from Christmas Tree Creek through open wandoo woodlands. (NOTE: For a shorter walk, you can turn right at ’19’ to follow the vehicle track eastward for 2km to rejoin the track at ‘27-1′, reducing the total walk by about 3km, but missing the very pleasant northern section. Alternatively, for an even shorter walk, follow the marked Christmas Tree Creek Trail which veers southward after about 800m after leaving ’19’). After ’19’ the Trail continues northward and soon rises more steeply to traverse a laterite ‘ breakaway’ slope and reach a laterite plateau and jarrah forest ‘20’. The track follows the edge of the plateau/valley rim and provides some excellent views across this secluded northern valley. Turn right at ‘22’ onto a vehicle track which heads generally eastward before curving southward and descending to cross a tributary of Christmas Tree Creek at ’24’. Cross another sidestream at ’25’ and then immediately cross the intersecting vehicle track on the south side of the stream to locate the foot-track which rises quite steeply SW through very picturesque open wandoo woodland to reach another laterite-capped ridge . From near ‘26’ there are good views across the valley and Scarp toward Perth. Veer ESE to follow the Trail along the edge of the laterite surface. At ‘27-1’ the foot-track meets a vehicle track (an old park boundary track) which leads to a T-intersection at ’28’. Turn right and follow the vehicle track SW, descending toward Jane Brook valley. 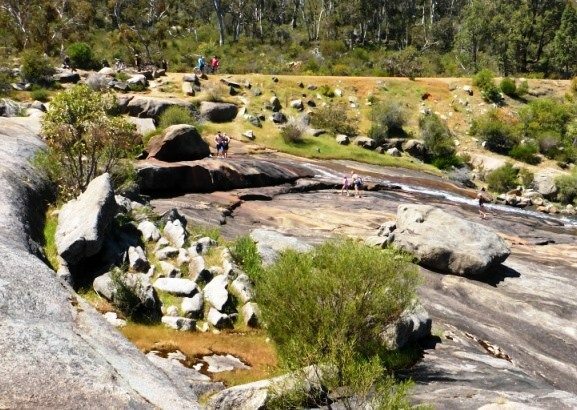 At ’31’ locate a sidetrack for a short diversion off the Trail via ’32’ to visit Hovea Falls, and descend a further 50m to the foot-bridge right at the top of the falls if you wish. Then head SW across the large granite outcrop to rejoin the vehicle track at ‘33’ and follow it down to ’34’ where it meets the Railway Reserves Historic Trail (the path of the former railway). Then at ‘35’ descend to Jane Brook and follow the north bank via ‘36’ alongside the small weir to then re-cross the Brook via the footbridge to get back to the carpark and Start point. Turn left into John Forrest National Park off Great Eastern Hwy and follow the sealed road to the main carpark/picnic area. A park entry fee applies. Walkers should register at the Ranger’s office both prior to commencing the walk and on return. In the north, follow vehicle tracks to Toodyay Road. In the south, return to the main carpark. “John Forrest National Park Management Plan”, CALM, 1994. -This also includes summaries of the flora & fauna, geology, history, future park plans, etc. 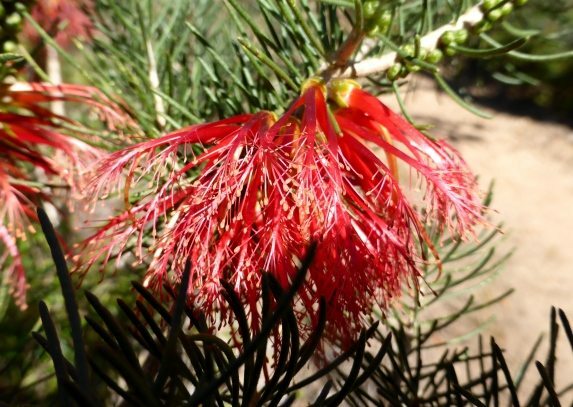 “John Forrest National Park: A Place of Beauty”, article by George Duxbury, in Landscope magazine (CALM), Vol.11, No.4, Winter 1996, pp.16-21. 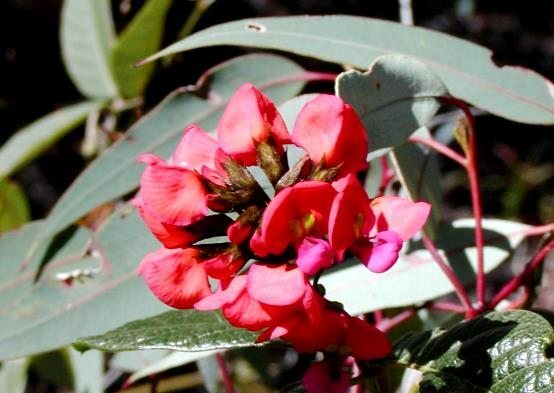 “Travellers guide to the Parks & Reserves of Western Australia”, Simon Nevill, 4th Edn. 2011, pp. 44-45 (Simon Nevill Publications) – Includes a summary of the Park. “South West WA 25K Scale Topo Maps”, Greg Harewood & Landgate, 2015. – Digital raster; ECW format on 16GB USB. See tiles #320-2134-III-SW and #318-2134-III-NW for relevant map coverage. No, it’s sole use for walkers only. 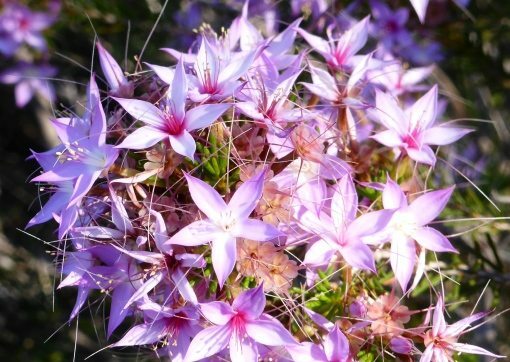 Check out Kalamunda Trails network and other Mountain Bike Trails on Trails WA site for the ‘official’ trails. Track re-alignment: A part of the original trail in the southwest has recently (2017) been re-aligned, now bypassing a partly degraded and Watsonia weed-infested section along Jane Brook below National Park Falls, plus a steepish climb to the ridge in the west. The re-aligned trail now incorporates part of the lesser known ‘Ridge Walk Trail’ and passes through more interesting bushland. The WalkGPS map has not yet been updated. 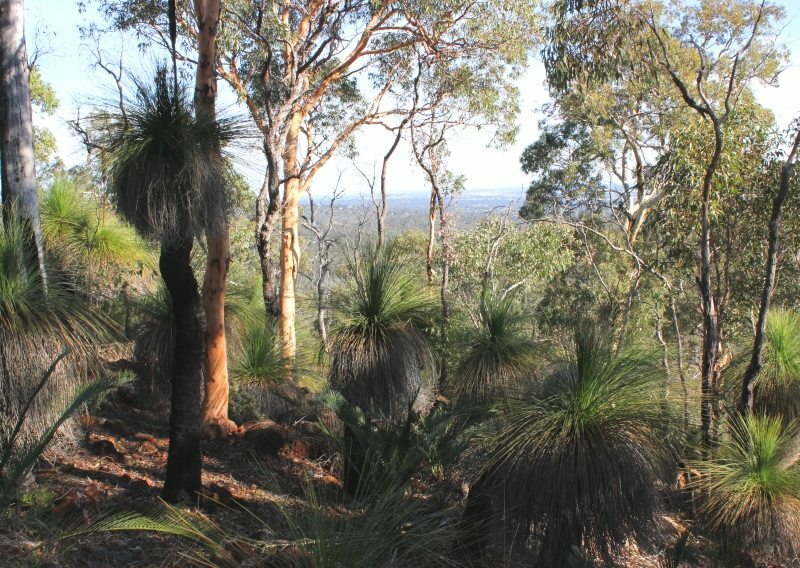 View toward Perth through balgas and wandoo trees on hilltop east of Christmas Tree Creek. Tranquil pool along Jane Brook 'promenade'. Bushland along north bank of Jane Brook. National Park Falls on Jane Brook. Massive granite boulders ('tors') near Christmas Tree Creek. 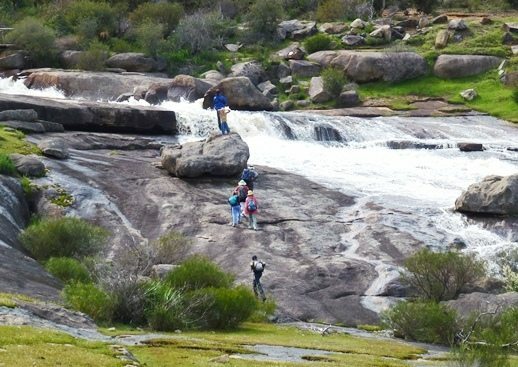 Hovea Falls (after heavy rainfall). 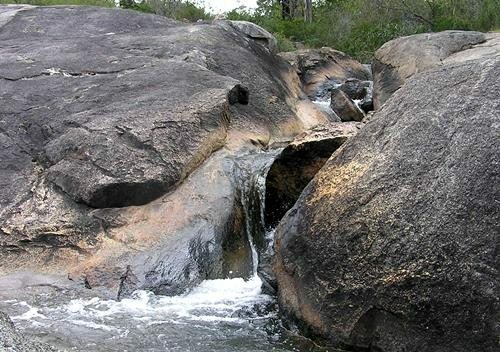 View across Hovea Falls (mid-spring, low flow). 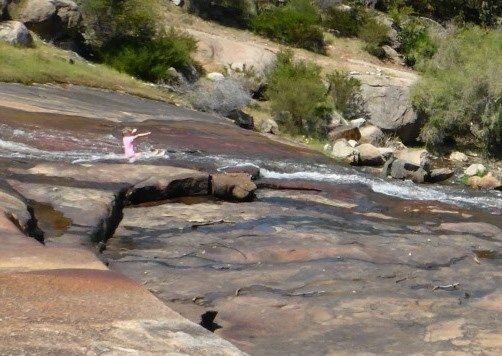 Youngster enjoys the natural water slide at Hovea Falls. Christmas Tree Creek cutting through rock ledge. View toward Perth through wandoo trees.